Earn your Girl Scout or Brownie Patch/Badges at our barn all year long, rain or shine! Lynnwood Equestrian Center is officially approved by the Girl Scouts Hornets Nest Council in Charlotte, N.C., as the barn to earn your Patch/Badges at! We invite your troop to visit our barn to learn and experience the world of horses. 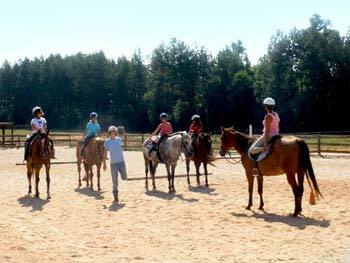 We offer programs for both the Brownie and Girl Scout horse educational patch or badge. Book your troop’s event soon, as it is a very popular event! Troop leaders can download the registration form and mail it in with a deposit. You may call the stable for more information. All pricing includes time on a horse, as well as the Patch/Badge(s) earned. A deposit is required at the time of booking a date, and final payment is due the day of, payable to Terilynn Storey. We do not give refunds. If we cancel due to bad weather, we will reschedule. Please wear closed toe shoes and long pants. Bring a raincoat and jacket when needed. Bring gloves in the wintertime. Our horses love carrots and apples, so feel free to bring some! Bring a snack and drink to enjoy while we are having our lesson time. A group picture will be made of the troop with one of the horses, so please bring your camera. Parents must sign a Liability Contract before their child rides, which can be downloaded and given to your troop leader to bring on the day of the event, or troop leaders can download this contract and give to each participant. This Badge will take about 2 ½ hours, depending on the number of girls. Cost: $35 per girl, which includes the Patch/Badge. Brownies will visit Lynnwood Equestrian Center, which is a 25 acre horse farm. We will look in the barn and horse stalls and see all the equipment that is needed in the stall. Learn how Lynnwood Equestrian Center feeds the horses and what they eat. Give a horse a special treat. The riding instructor will show you the correct way to mount and dismount from a horse. Sit in the saddle and take hold of the reins. 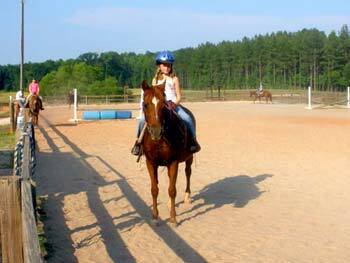 The instructor will also lead you on a short ride in order to get the feel of how the horse moves. You will learn what you should wear while riding a horse and how does the clothing that you wear keep you safe while you are riding. Look at the special riding helmets and learn why you always wear a riding helmet when riding. Watch someone grooming a horse and then help groom a horse using a brush, currycomb and hoof pick. Learn what the horse’s coat feels like and brush the horse’s mane. Learn what “tacking up” a horse is and look at a saddle and learn the difference between a Western and English saddle, what does the girth do, and how the saddle pad protects the saddle from the horse’s back. These two Patches will take approximately 2 hours each and can be obtained together or separately. Cost is $35.00 per Patch/Badge, or $55.00 together, which includes both Patches/Badges. Cost and types of disciplines offered at our stable. Are lesson horses available or do you have to own or lease your own horse? 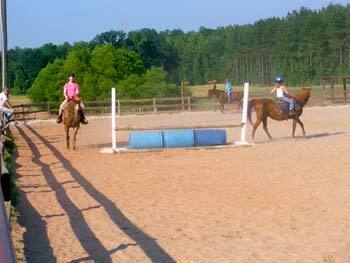 Available riding facilities, such as a ring, roundpen or trails. Types of feed a horse needs daily. Everyday care in a stable. How often a horse needs to be shod and why. Demonstrate how to clean a stall and why it’s important for the horse. Correct and safe clothing for shows. Safety features in footwear, pants, helmets. Learn about three horse careers and what it takes to do each one, i.e., schooling required, experience, etc. Learn the parts of the saddle and bridle. Learn how each part contributes to the comfort of the horse and rider. Learn how to care and maintain the saddle and bridle, and how it properly fits on the horse. Learn about a famous horse. Groom, saddle and bridle a horse, using crossties to do this. Learn the difference between English and Western tack and how to take care of it. Mount and dismount a horse. Turn and stop a horse at a walk and jog. Learn about tools for grooming and practice your new learned skills on a horse. Learn how the grooming process changes with the seasons. Learn the parts of a horse and label them on a diagram. Discuss common ailments and diseases, and ways they can be treated and how to prevent them. Take a horse’s vital signs. We welcome the youngest of the Scouts out to the barn for an introduction to horsemanship. This Patch will take 1 1/2 hours and is $25.00 a child. Where do horses live and what do they eat. Learn five body parts of the horse. Horse grooming tools used and how to properly use them. Riding a horse on a lead line.